Before it’s time for UFC middleweight champ Anderson Silva to hang up ’em up, he has his sights on going down as the best mixed martial artist ever to put on gloves. With only four fights left on his UFC deal, Silva has a long way to go if he wants to be the G.O.A.T. (Greatest Of All Time). “I just think Anderson wants to be involved with the biggest fights possible and the biggest fights that the UFC can put together. 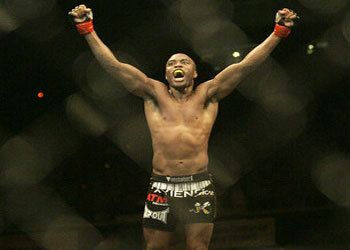 If it’s at 205, 185 or if it’s at some catch-weight, it doesn’t make a difference,” Silva’s manager Ed Soares stated. Ideally, The Spider would like to move up to the light heavyweight division and challenge for the title there, however his homie Lyoto Machida will be taking on current 205-pound king Rashad Evans at UFC 98. “If for some reason Lyoto Machida is not successful on May 23, then who knows? Maybe we will go after that title, but right now Anderson feels the 205-pound belt belongs to Lyoto. He just hasn’t had the chance to fight for it yet,” said Soares. And what would happen if Machida jacks Evans’ strap? “A fight with him and Lyoto is never going to happen. He just wants to have superfights,” Soares said of his client’s goals. Unless you have been living under a rock for the last few years, there is one major mega fight left in MMA. If UFC welterweight champ Georges St-Pierre can get past Thiago Alves at UFC 100, it kicks the door wide open for a future 185-pound clash with Silva.